Life is one of the greatest challenges that everyone has to face and overcome to be successful. Every day is a challenge, or even an exam, that prepares us both physically and mentally for many days (and tougher challenges) ahead. Unless we can solve the challenges and mysteries of life today, we then suffer from psychological disabilities that make us feel defeated for eternity. Unless you build a positive and an unstoppable mindset to every challenge that comes your way, then the biggest disability will be the limitations and insecurities that we set in our lives. Nonetheless, every successful person you see around is a motivating testimony of the infinite aptitude of the human potential, but only if you believe. Certain aspects of life have, and need, to be embraced and appreciated to be able to face and overcome many of the life’s challenges. One fact about life is that, although everyone struggles with various challenges at one point in their lives, how they handle and deal with these challenges is what determines their success. 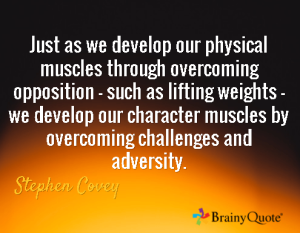 The same way a bodybuilder starts out thin and weak but faces the challenges ahead (intense and strenuous exercise), is the same way we should approach life and anything it serves for us. Outlined below are several tips and strategies on overcoming real life challenges for a better future. 1. Focus more on the positives than the negatives in life: Staying positive is the best remedy for everything. Just because you encounter a setback doesn’t mean you should stop there or quit, strive to overcome whatever obstacle you are facing and everything will start falling into place. The best reward you can give yourself is the feeling that you overcame something you never thought you could. The moments in life that we overcame adversity and accomplished something worthy always brings smiles to our faces. 2. Never let your emotions guide you: Although it is normal to feel sad, angry, pain and any other feelings, never let the emotions take over. The best ways to deal with a problem is by observing and analyzing the problem carefully, and then decide on the best approach to address the situation. You will be amazed at what you can do, but only if you make well-calculated action plans. One of the most important rules in life is, observe carefully first then decide what to do next. 3. Face the challenges head-on: The first step to overcoming real life challenges is by having the heart and will to face them head-on. Trying to go around a problem or avoiding it doesn’t solve anything at all. Courage is of utmost importance if you are to succeed at all. If anything frightens you, it will keep doing so until you face it and do it. You will be amazed at how simple some challenges are when you face them with courage. 4. Gratitude: There is a saying that goes; no problem is bigger than a man is. What this saying basically means is that, you will never be tasked with a challenge you cannot overcome. As mentioned earlier, the biggest disability in life is created in our minds. Having the right mindset and appreciating the fact that you are facing these challenges not only makes you human, but also makes you stronger in life. Many of the challenges we face in life are designed to make us stronger for tougher times ahead (if any). 5. Exercise: Regular body exercise plays a vital role in our lives. For starters, it is through regular body exercise that you can fight obesity and improve your self-confidence as well. Exercising regularly boosts body immunity and makes our brains stay alert at all times by increased blood flow. As long as your mind is alert, you should be able to tackle most of the problems presented to you without struggling, when mind is sharp. In case you didn’t know, exercising improves your cardio health and boosts blood circulation to all the vital organs of the body. 6. Celebrate your achievements: One of the biggest mistakes that people make is not appreciating their efforts and accomplishments. If you overcome a challenge you never thought you could, take some time to celebrate it. This drives your brain into taking in more and more challenging situations positively knowing that you will eventually succeed. The pleasure in being able to overcome many challenges is what will drive you into overcoming real life challenges as they come. 7. Stand tall: Whenever faced with a more challenging situation, stand tall and tell your mind that you can make it. This gives you an unbreakable confidence that helps you seek ways to tackle the problem without breaking. This spirit is ingrained deep in your mind each time you overcome a challenge hence making your life even more successful. 8. Stand in another person’s shoes: Sometimes the best way to deal with a problem is by asking yourself how another person’s (maybe a role model) would do it. If you are faced with a challenge that a friend, a mentor or even someone older than you faced but was able to deal with, trace how he/she was able to do it, then try doing it as they did. Sometimes life needs a little motivation and thinking outside the box to run smoothly. 9. Build positive habits: Although willpower and self-control are vital virtues in life, how you execute them is what matters especially when faced with a real-life challenge. Having a positive mentality can help you deal with a rather harsh challenge rather smoothly with no one noticing that you were in distress. Building automatic positive habits whenever around people and handling life issues is therefore recommended. 10. Reach out: Most people block out their friends and family when faced with a real-life challenge. Although asking for help may be hard, it is always a wise idea to let people in and accepting their help. When you reach out for help/support, be keen to see how these people deal with the situation, as you never know what the future holds. As the saying goes, once bitten twice shy, you will be better prepared for a similar challenge in the future than you are now. Although some challenges may make our lives miserable, this doesn’t mean we are destined to live a miserable life. Learn to enjoy the hot cup of tea, the company of old friends, and other small things in life. Since you can’t look for happiness, let it find you by helping people who need your help. 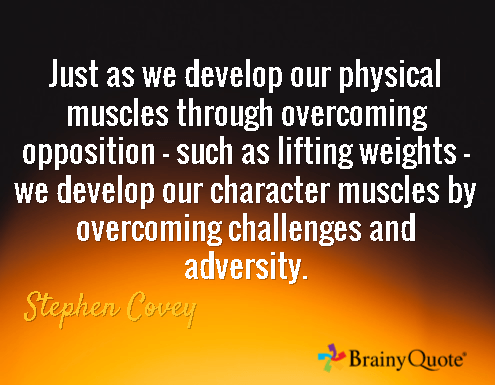 It is by living a happy life that you will be able to overcome most of the challenges that come your way.